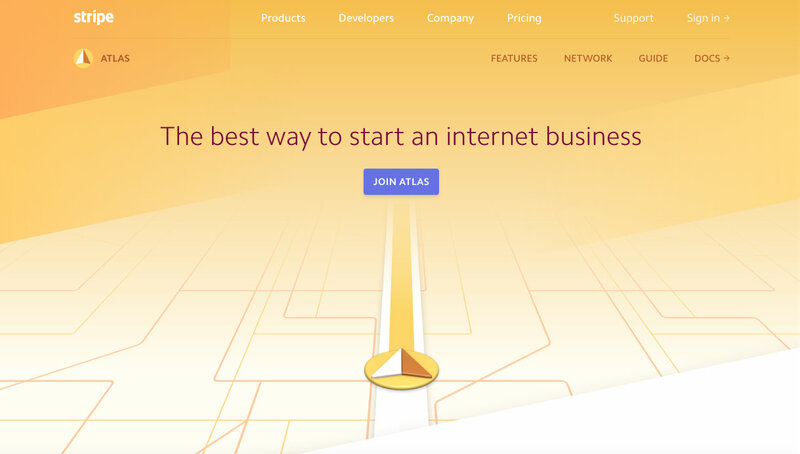 Stripe Atlas is a tool that helps entrepreneurs to quickly establish an internet business by handling tedious legwork. How do I…? How do I…? How do I…? How do I…? How do I…? Trying to start up an internet business raises endless questions. Understandably, Founders like to focus on the questions related to making great products and services and growing their company. I’ve yet to meet the Founder who’d rather concentrate on concerns related to banking, taxes, paperwork. helps entrepreneurs start their businesses faster by handling the boring essentials. Atlas spares you the pain of filing paperwork, making trips to the bank and doing the usual research involved in figuring out how to get started. You fill out a simple form and Atlas takes care of the rest. They generate the necessary documents, complete filings and manage the account setups. From the time you submit your application to Atlas, it’s only a matter of days until you have a legalized company incorporated in Delaware, a bank account and debit card, and you’re ready to start accepting payments from customers. Atlas uses the “standard defaults” and the “leading bank for startups” to accelerate the process and eliminate any guesswork. And Atlas is available to entrepreneurs around the world. Another Altas user or network member can invite you to join the community instantly, otherwise you tell them about your company and wait to hear back – though they are reportedly swift in their replies. In addition to Atlas dealing with paperwork on your behalf, you gain access to expert legal and accounting advice. Should you need more assistance with things such as stock agreements and tax preparation, you have a direct line to pros who specialize in helping startups. What’s more, Atlas hosts a private discussion board where Founders, investors, and accelerators can connect. They don’t show up in the ledgers, but energy and momentum count. Big time. And nothing can steal both quite like paperwork. To learn more about how Stripe Atlas can help you keep sprinting from the outset and start your business more easily, visit stripe.com/atlas.